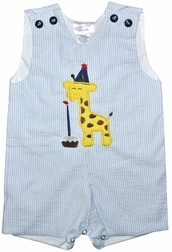 We just thought this was adorable for little boys' birthdays! Here we take light blue stripe seersucker and make your choice of a John John or longall. The shoulder straps fasten to the front with navy fabric covered buttons. 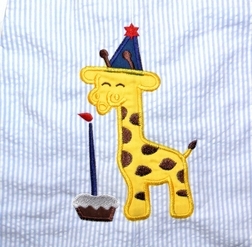 On the front, we applique a precious yellow giraffe with brown dots. He is already for the party with his navy blue party hat and cupcake! 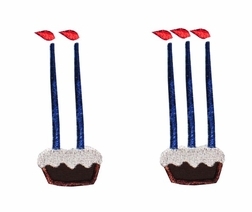 Watch him try, try and try again to blow out the candle with no luck! Available for his 1st through his 3rd birthday.